You demanded it and we delivered! Actually, no one requested this movie, and we may catch some flak for reviewing it. Francis Ford Coppola slums it in the cash grab maudlin 90s with Jack! 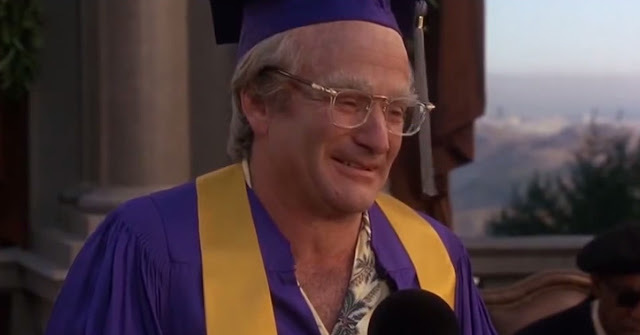 Robin Williams (also slumming it) plays Jack, a ten year old boy with a fictional medical condition that causes him to age at four times the normal rate. This gives Williams ample opportunity to utilize his deadpan imitation of a five year old boy. But just in case you thought this movie was funny, it frequently vacillates from goofy romp to melancholy reflection on mortality more quickly than an episode of M*A*S*H. Also starring Jennifer Lopez, Bill Cosby, Diane Lane, and Fran Drescher. After One from the Heart led to Coppola to file for bankruptcy, he spent much of the '80s and '90s taking on director for hire type roles to pay the bills. While he never returned to his '70s glory, he does make a pretty good wine!